Why put a dog on a cartoon web site? Rooter's friendship and inspiration are a large part of my success. As a pup he would ride with me to deliver cartoons to Ad agencies and the little guy was often a welcomed visitor. 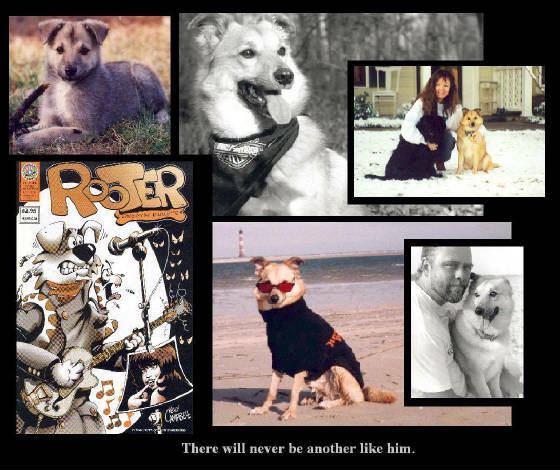 Rooter's image became the staple for greeting cards and soon evolved into a comic book idea. With the help of John Powell of Powell & Partners Creative in Charlotte, NC, Custom Comics of America was created and a series of "Rooter" comic books ensued. John, Rooter and I traveled the country becoming "those guys with the dog" in many places. John's "PT Barnum" sense of adventure soon turned us into "those guys with the dancing girl, giant albino Boa Constictor, etc." We were written up in newspapers, booked on TV shows and traveled to New York, Chicago, Los Angeles, San Diego, Dallas, Atlanta.... on and on. In the process, I became a real cartoonist, learning to meet crazy deadlines, and be very creative in the process. I owe a lot to my friends like John Powell and Jim Zeman of Custom Comics of America. I owe special thanks and loving memories to the best friend I'll ever have. My little buddy. Rooter.